It’s formulaic, overblown and downright preposterous at times, but it’s also everything moviegoers want in a summer action movie. Speed has a tight, rapid-fire script, awesome sound design, a remarkably kinetic score, and surprisingly good acting for a movie of its type. 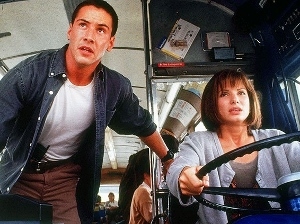 Sandra Bullock gives a sweet, naturalistic performance as a woman stuck driving a bus full of passengers that will explode if it falls under fifty miles per hour. Dennis Hopper is memorable as the crazy bad guy who planted the bomb on the bus. As for Keanu Reeves? Well, he may have limited range, but that range fits perfectly within the confines of this movie. You can knock Speed for one reason or another, but it’s so damned fun, why bother? Directed by Jan de Bont.